When the phone rings, we never quite know what to expect from the caller on the other end. Who would’ve predicted bobcat Copper’s full story? Someone saying she was an out-of-state rehabber was calling to share the story of a baby bobcat kitten saved from a barn fire. At only four weeks old, his eyes had just been starting to open. But it was already obvious his right eye had been damaged by the fire. 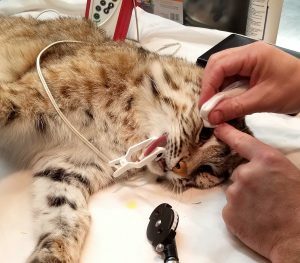 Bobcat Copper also suffered burns in his mouth, on his paws and his belly. 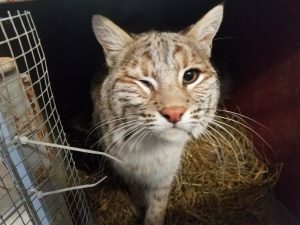 Why did this wild-born bobcat need a permanent home? Now, at nearly two years old, Copper still has a damaged right eye that weeps and has light sensitivity. Even though he’d had a long period of ongoing care, living with domestic cats, it would be impossible to release him back to the wild with any hope of survival. The rehabber was hoping we could accept him at the sanctuary so he’d at least have a chance to live wild at heart here with other bobcats. She agreed to transport him to us while we were busy making arrangements to pick up another bobcat out-of-state we’d been contacted about. Our hope is that these two wild-born bobcat arrivals will be able to live together and form a bonded friendship. We’ve seen happy endings like this before. We know that, through our supporters, we’ll be able to provide all they need to thrive here at the sanctuary, too. Will his eye damage be permanent? Happily, when Copper was sedated for his intake exam, the veterinary team found that his eyelid had been folded under all this time. His eyelashes were rolled inward, irritating his eye. The veterinarian was able to unfold the entire eyelid, giving him full use of his eye. We’ll continue to monitor it, but it looks like Copper is finally pain free. His eye appears darker than the other one, perhaps from the fire or perhaps he was born that way. We’ll never know. If you’d like to do something extra special for bobcat Copper, why not consider becoming his sponsor parent? It’s easy to do HERE.